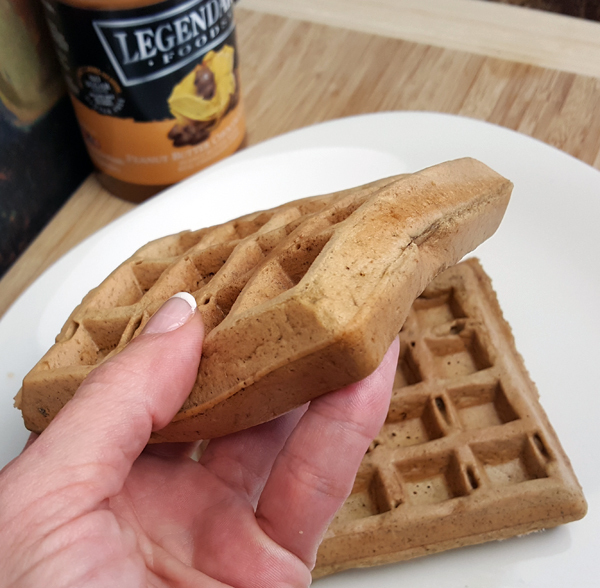 Easy Low Carb Waffle Recipe ~ Gluten Free, Thick & Fluffy, with a Surprise Ingredient! This is not an original Low Carb Waffle recipe. I didn’t come up with this brilliant idea on my own, lol. That’s one of the features I love most about that box specifically: the inserts they include with creative recipes for the products inside. I’m NOT creative in the kitchen, so it’s fun to experiment with new foods & recipes every month! 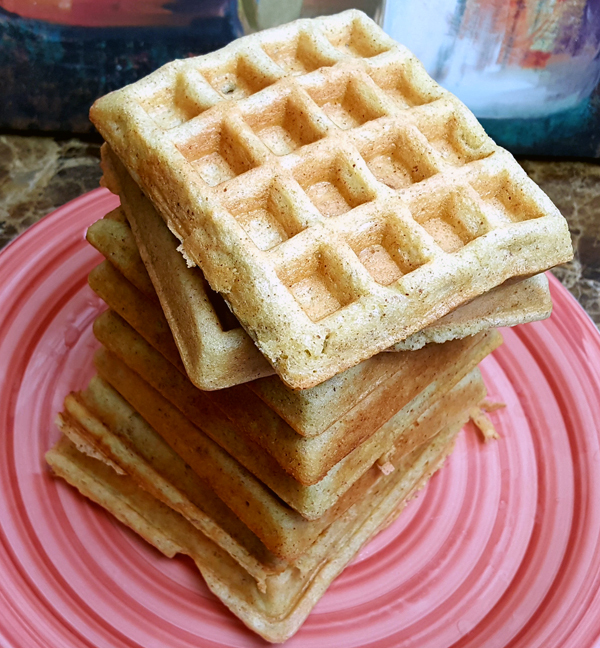 I’m working with both companies so I have discount codes for you for both, which also means I earn commission on referrals, but this Low Carb Waffle Recipe stands on it’s own with very simple low carb ingredients you probably already have. I never even considered cooking or baking with nut butters! 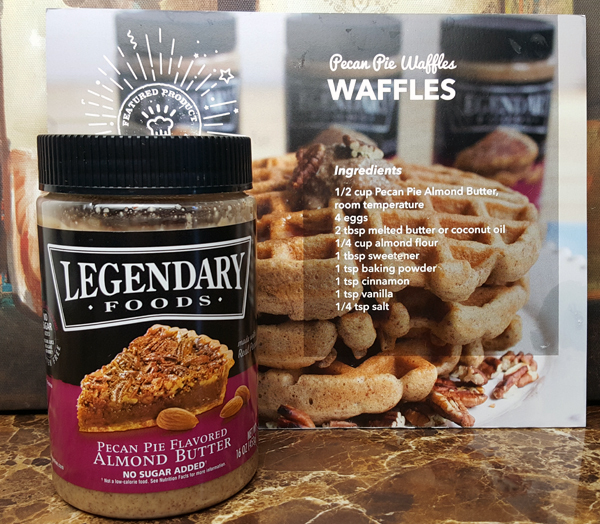 The Legendary Foods Pecan Pie Almond Butter is so delicious you could literally eat it straight out of the jar off a spoon (and I have! 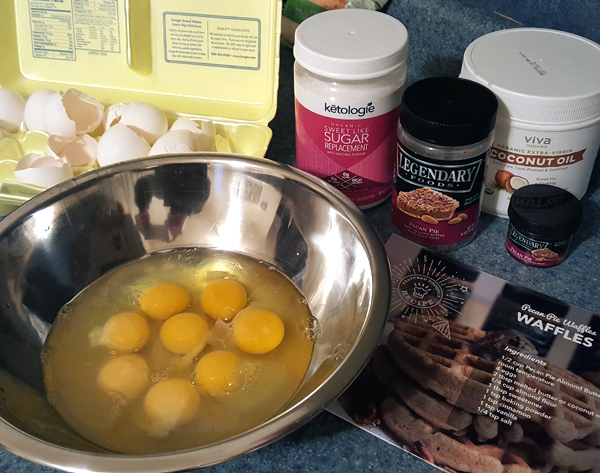 lol), but the recipe intrigued me so I decided to try it out… after several other low carb waffle FAILS over the years. I have NEVER had a low carb waffle come out so thick, fluffy and PERFECT before! My attempts always ended up in a mess I had to scrape out of the waffle maker, lol. Let’s get on with the recipe already… you’re going to love this one!! The cinnamon and vanilla are optional, and I used half the sweetener it called for, but feel free to experiment to suit your taste preference. I use and prefer Sweet Like Sugar as the sweetener, but also tried Swerve and the recipe came out the same with both. You can use ANY kind of nut butter in this recipe. I’ve experimented with several myself. But the Legendary Foods flavored nut butters were definitely the best! Especially Apple Pie, Blueberry Cinnamon Bun and Pecan Pie almond butters. If you use a plain nut butter, you might want to add blueberries and/or chopped nuts to give them more flavor. ^ Those were the original directions on the recipe card. I have a small 2-plate waffle maker, and I used less batter per waffle (1/4 – 1/3). 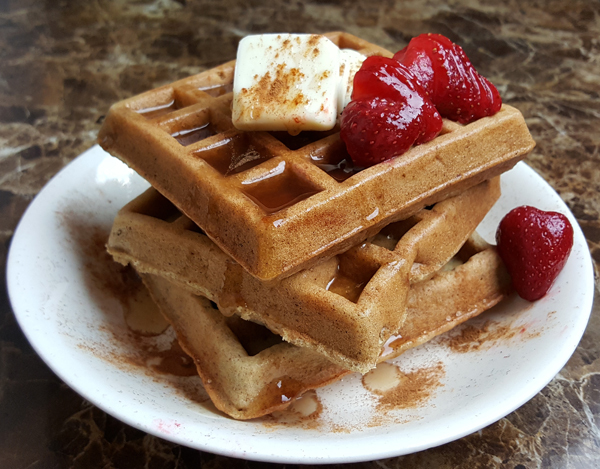 Doubling this recipe, I got TEN full waffles and they came to only 2.5 net carbs each. If you don’t have a waffle maker, or you just want pancakes instead, you can use this recipe to make pancakes too. I’ve tried it, and they turn out just as fluffy & delicious as the waffles. You’ll just want to use the MyFitnessPal Recipe Calculator and put in all of the ingredients you use, based on your own labels, and put in the number of servings (number of waffles or pancakes you make) so you can log them accurately. 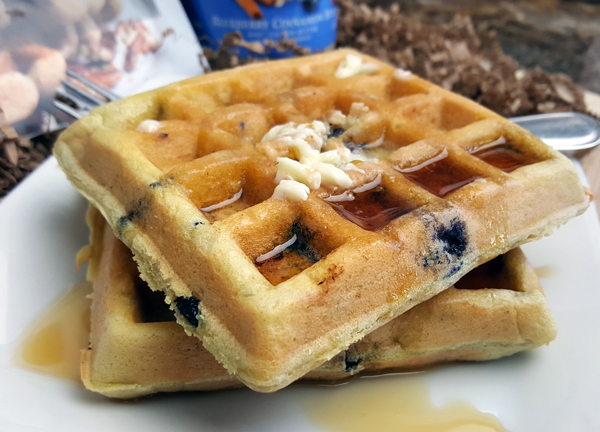 Using the exact same recipe, this time with the Blueberry Cinnamon Bun Nut Butter and adding frozen diced blueberries, made the BEST blueberry waffles I’ve ever had in my life! It’s almost hard to believe these are low carb, gluten free and HEALTHY. I mentioned above that I doubled the recipe, which you can see in the photo which has EIGHT eggs. With pancakes I would just make a single batch, unless you’re serving more than two people. But the waffles are GREAT leftover, and can be popped in the toaster and enjoyed later – so it’s great for “meal prep” to enjoy several mornings in a row, or to take with you on the go. That stack is missing two waffles – because they were on MY PLATE! It never (EVER) occurred to me that you could cook or bake with nut butters! 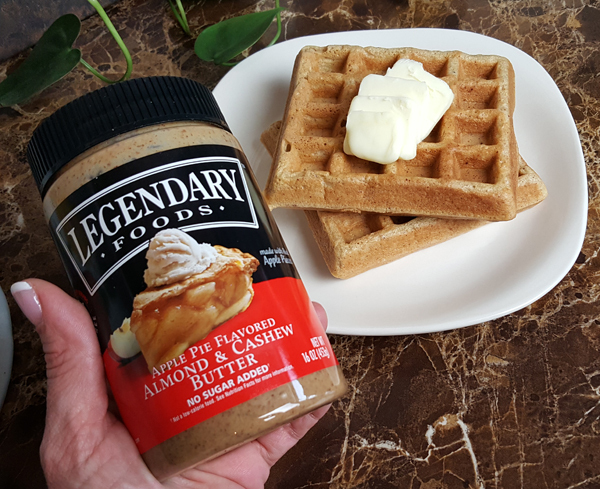 I also had no idea there were such delicious low carb almond butters out there – until I discovered Legendary Foods. 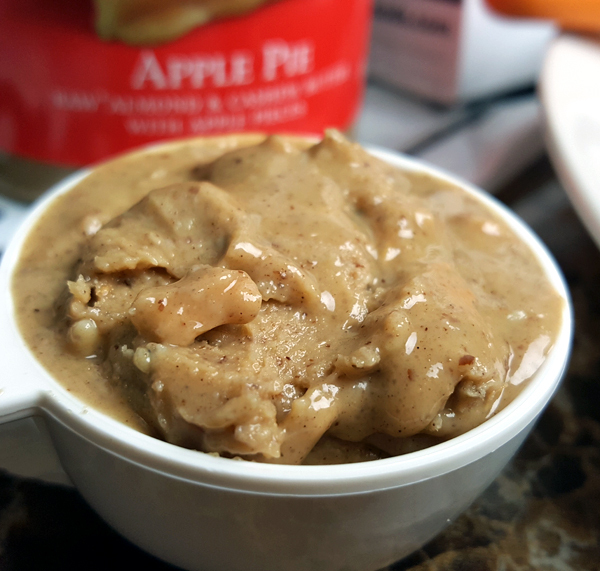 Just LOOK at their Apple Pie Almond Butter… YUM! It’s good on celery, on crisp cucumber slices, on a spoon, licked off your finger or used to make pancakes or waffles (or even muffins!) using the simple recipe above. Yes, muffins: perfect, fluffy, delicious low carb muffins! 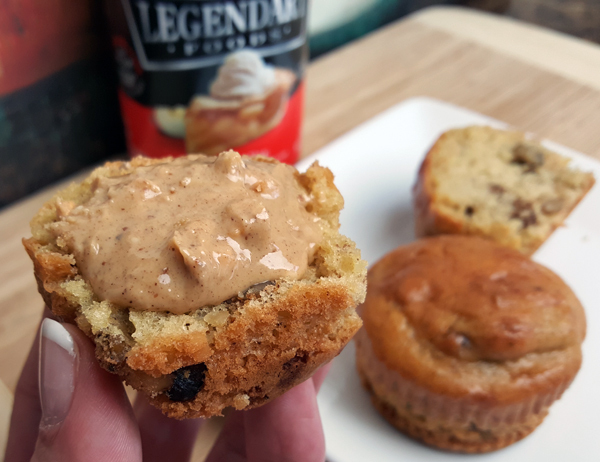 I’ve tried all five Legendary Foods Nut Butters flavors. I could eat all 3 of those straight out of the jar! The other two flavors (Peanut Butter Cup and Peanut Butter Chocolate Chip) were okay. They didn’t really “wow me” or anything. Since I have them I’ve been using them in this recipe, or to make fat bombs – but I wouldn’t go out of my way to reorder those two flavors. If I had to pick a FAVORITE of the three above, it would be a TOUGH call. 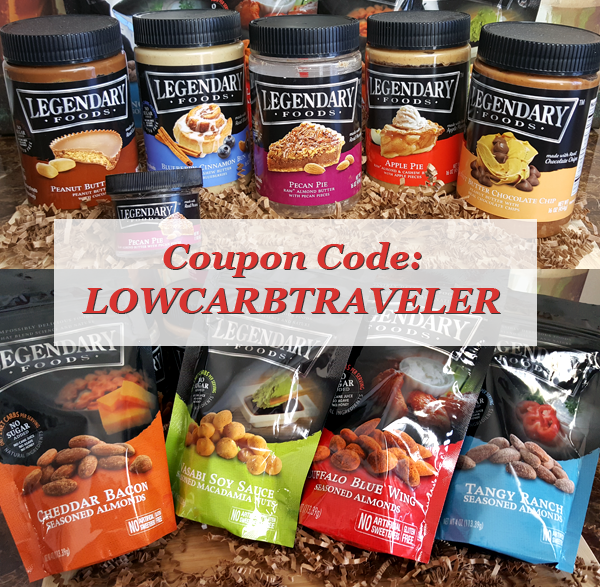 They are all three delicious with a great flavor and texture, and all three very low carb. Blueberry & Apple are both 2 net carbs per TBSP (or 4 net carbs per serving), while the Pecan Pie Almond Butter is half that: 1 net carb per TBSP. It all depends on what flavor you’re in the mood for. I’ve made about half a dozen batches of this recipe so far with various flavors and in various ways (pancakes, muffins, waffles) and every single batch has turned out GREAT! The Blueberry Cinnamon Bun Nut Butter is a personal favorite, especially since they changed it from Cashew Butter to Almond Butter which drastically lowered the carb count (now just 2 net carbs per TBSP). There are so many other ways to use these FUN flavored nut butters, so if you have some – or you’re ordering some today – stay tuned for more creative recipe ideas. I’m having so much fun with these nut butters and can’t wait to share more of those delicious ideas with you! In the meantime… weekends are made for waffles! p.s. In addition to the fabulous flavored nut butters, Legendary Foods has AMAZING seasoned almonds and Wasabi Macadamia Nuts too. Beef and vegetables. It doesn’t get more straightforward than that. It gives you everything your body needs in one delicious meal combination: protein, fat, and healthy carbs full of vitamins and minerals. So, how do you take this classic combo and improve it even more? That’s easy –make it into a pie. 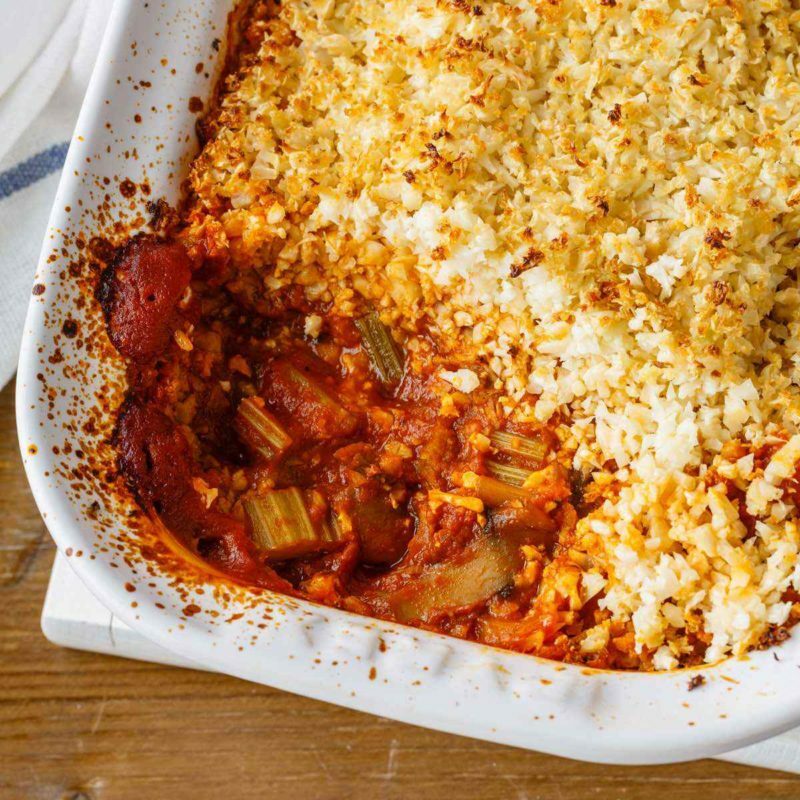 This recipe makes an unbelievably delicious country beef and vegetable pie that’s 100% gluten-free and paleo-friendly thanks to the cauliflower ‘pie crust’. This recipe features a perfect combination of vegetables to go along with a juicy pound of lean rump steak. 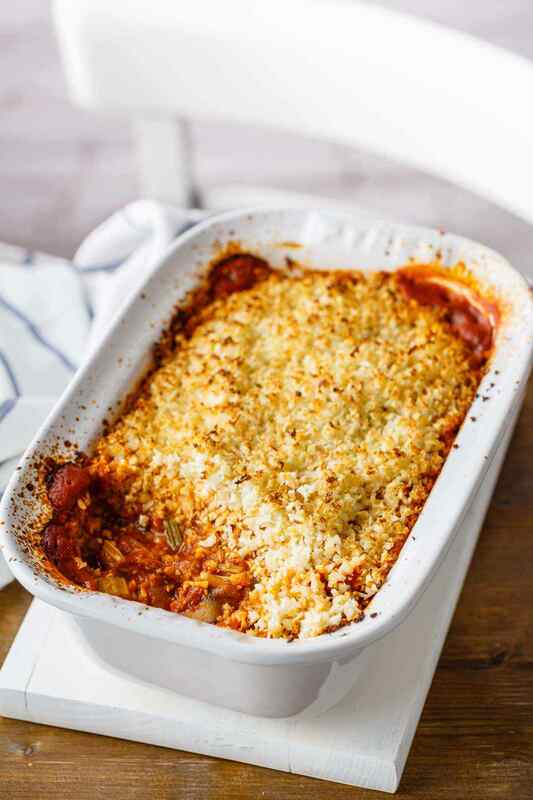 It’s got it all — carrots, celery, onion, garlic, mushrooms, tomatoes, rosemary, and of course the cauliflower that has been blended into an excellent pie crust substitute. Traditional pie crusts are made with ingredients such as refined flour, which can be a common cause of inflammation in many people. (1) As paleo diets cut out all refined flours due to their grain content, we had to come up with a way to make the perfect pie crust for this beef and vegetable pie. Country vegetable and beef pie is one of those old-fashioned meals that ticks all the boxes. It’s so full of flavor that even your kids will love it, vegetables and all. 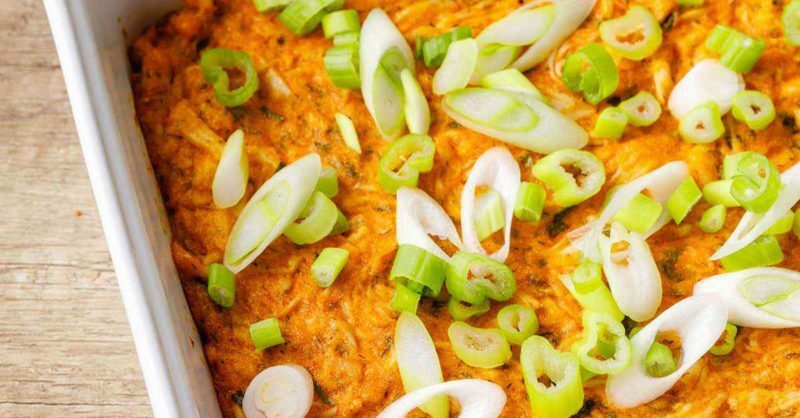 Weight watchers will be happy to note that this type of pie won’t add inches to the waistline, as it’s incredibly satiating and helps reduce abdominal fat due to the high vegetable content and healthy fats. Give this recipe a try. I’m almost 100 percent certain that it’ll become a staple in your household as it is in mine. P.S. – If you’re looking for more great paleo recipes that make good use of beef combined with tasty vegetables, then look no further. I’ve listed a few of go-tos that I like to whip up every so often. And when talking about the omega-3s, salmon has and an astounding 1.5 g of DHA in just a 3.5 ounce serving. DHA is a critically important omega-3 fatty acid, especially for brain health. Always choose wild salmon as opposed to farm-raised. Consuming farm-raised salmon means that you’re consuming an inferior product, not just from a nutritional perspective, but from the potential risk for contamination from a variety of toxins as well. If I’ve got you thinking about dinner tonight or this weekend, here’s a simple salmon recipe that doesn’t take much time to prepare. My tip if you cook this: Garnish with the cracked pepper. It offers just a hint of heat to balance the fatty fish and the buttery sauce. The post Dinner Tonight? How About Some Wild-Caught Salmon! 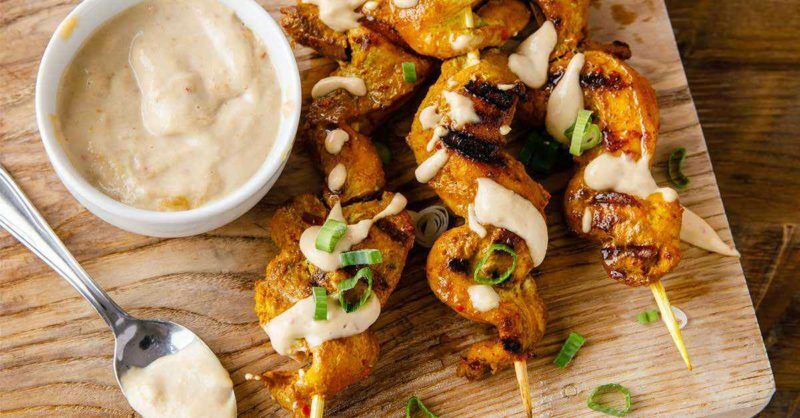 appeared first on David Perlmutter M.D..
Chicken satay skewers are a staple in Southeast Asian cuisine because they are so easy to make but are incredibly tasty. The secret lies in the unique marinades used as well as the blend of spices that really bring out the flavor in the chicken. If done properly, each bite should have you coming back for more. 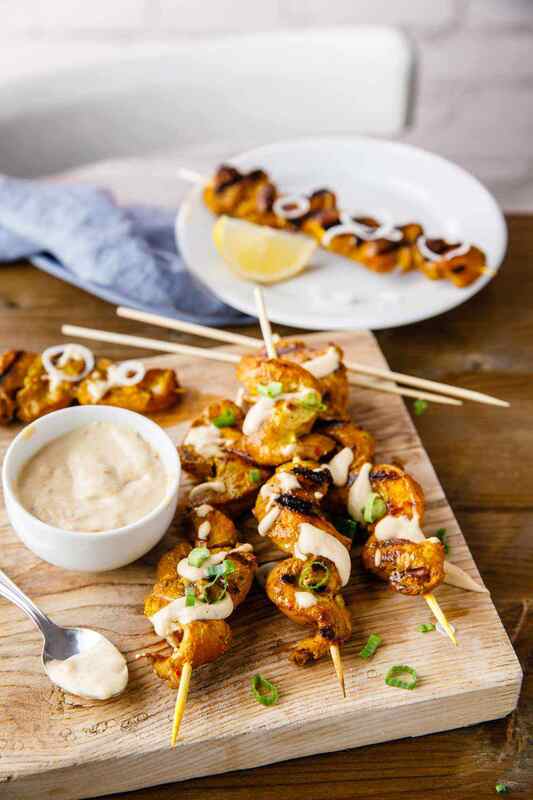 Usually, the chicken is marinated for a few hours but our paleo skewers recipe requires even less than 30 minutes to prepare and cook. 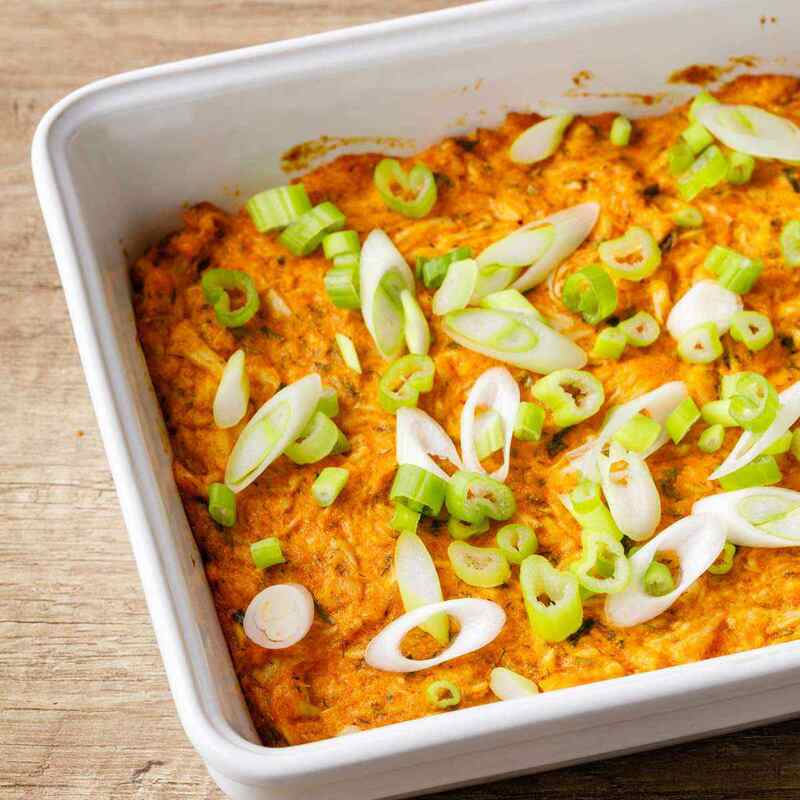 This recipe also contains a lot of protein, so it can be served alone, but it is usually paired with side dishes such as sweet potatoes or cauliflower rice. At times, cooking chicken can be quite tricky. Undercooking chicken may increase the risk of salmonella (1), while overcooking it may result in a rubbery, dry texture. Two methods that can help you cook your chicken to perfection is by cutting it as evenly as possible and by using a digital food thermometer. Digital food thermometers are the go-to thermometer for cooking since they give a more accurate reading. 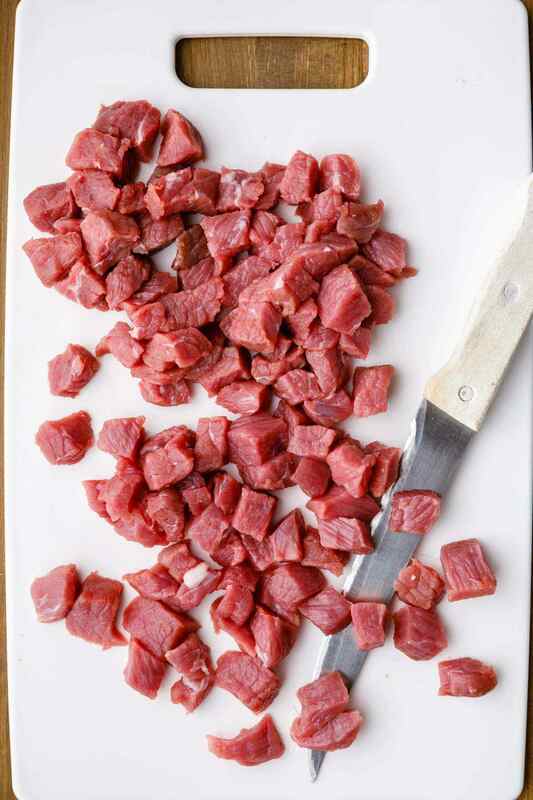 Greater accuracy will help you cook your protein of choice to whatever doneness you prefer. As mentioned earlier, the secret to a good satay recipe lies in the marinade and the sauce. 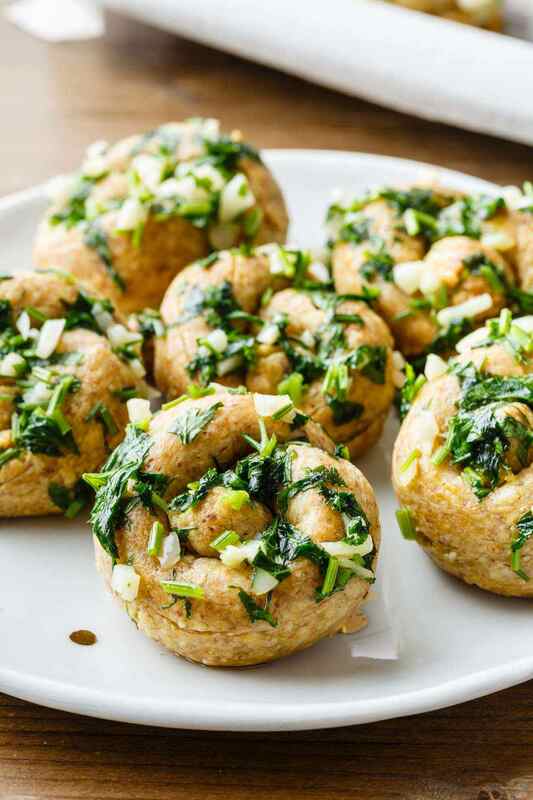 All the ingredients used to make them are paleo-approved and available in most grocery stores, so you shouldn’t have a problem putting this recipe together. Furthermore, the ingredients only contain a trace amount of carbohydrates which is ideal for those who are trying to shed excess fat, or those who are following a low-carb or Ketogenic Diet. Properly marinating the chicken breast strips is crucial for achieving the burst of different flavors associated with satay recipes. It’s important to remove any excess skin and to pierce the meat with a fork before soaking to maximize the chicken’s absorption of the marinade. Usually, a minimum of 2 hours is sufficient for the chicken to absorb the flavors in the marinade but it can also marinate for as long as 2 days in the refrigerator. Chefs and experts prefer meat to marinade for a longer duration to ensure that it soaks up as much flavor as possible. Additionally, the acidity in the lemon juice will help soften up the chicken meat, resulting in tender flesh that is sealed in moisture. The recipe for this satay sauce is slightly different from traditional satay sauces since it doesn’t include dry roasted peanuts. Instead, it makes use of tahini; a popular sauce in the middle eastern region. Tahini is made from toasted sesame seeds, which gives the sauce a stronger flavor. A tablespoon of lemon juice is included in the sauce to cut through the earthy flavor of the tahini. The last two major ingredients in the sauce, chili powder and coconut milk, are two contrasting flavor profiles that work well to combine all the ingredients together for a sauce that packs a unique, flavorful punch. 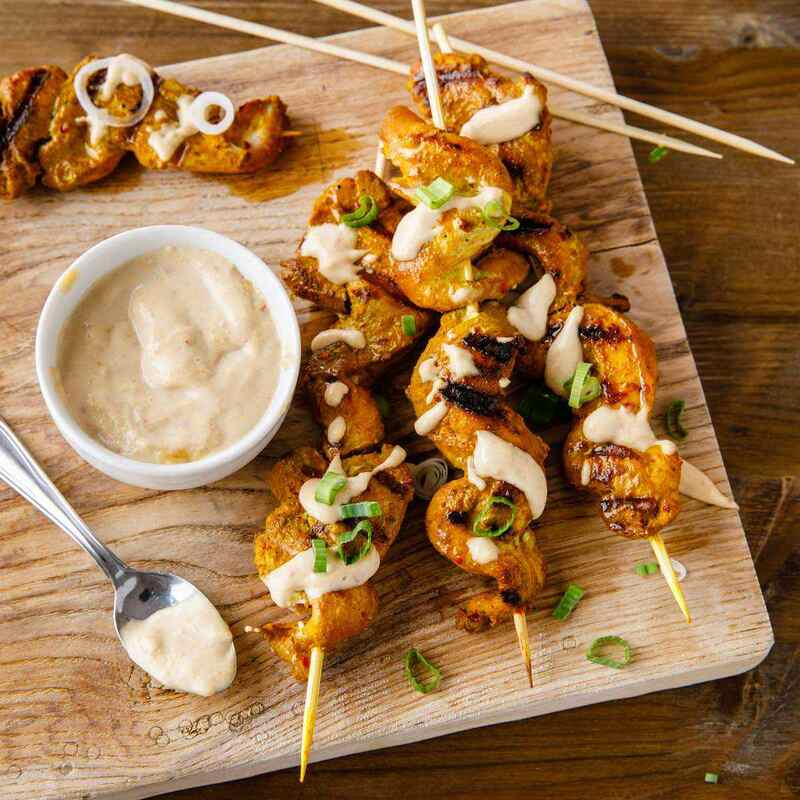 Chicken satay skewers are an excellent high-protein, low-carb, and moderate fat meal to provide the body with essential nutrients and much-needed energy to last you throughout the day. The fats present in the chicken skewers and sauce are good fats that the body needs in order to maintain healthy hormone levels and a strong immune system. The preferred choice of cooking the chicken satay skewers is on a grill but broiling them in the oven is an acceptable option as well. 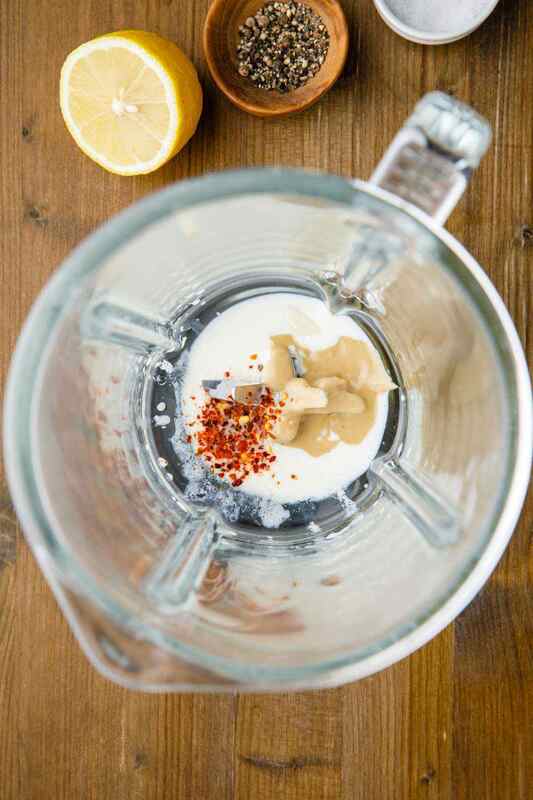 To make the marinade, place all the ingredients in a blender and process until smooth. Pour the marinade over the chicken and toss to coat. Cover with plastic wrap and refrigerate for minimum 30 minutes. To make the sauce, mix all the ingredients together until well combined and set aside. Thread chicken onto skewers. Preheat a grill pan over medium high heat. Lightly oil the grill pan with extra olive oil. Grill the chicken in batches for 2-3 minutes on each side. Sprinkle with spring onions and serve with sauce and lemon wedges. PS. Here’s an amazing Thai spaghetti squash noodle recipe that will compliment the flavors of chicken satay skewers. You could also pair it with some cauliflower rice, which is a paleo alternative to rice grains. Just because you’re traveling, socializing or out with friends doesn’t mean you can’t stick to your priorities: your health goals and your way of eating. Assuming your health & weight loss goals ARE a high priority to you. It took me a long time to realize that, to change my mindset, and to actually start enjoying LIFE instead of always focusing on the FOOD. It started with becoming mindful of my choices (and being deliberate about them), and also being realistic about “treating myself” -vs how BAD I was treating myself. I finally realized that choosing to indulge meant choosing to feel bloated, guilty, and down on myself. It meant choosing to be back in chronic pain, and miserable with inflammation and swollen ankles. Now… going out is an opportunity to have FUN. While I still enjoy beautiful foods (low carb, of course) the food is no longer the focus – it’s simply the fuel. Although the food is still delicious! 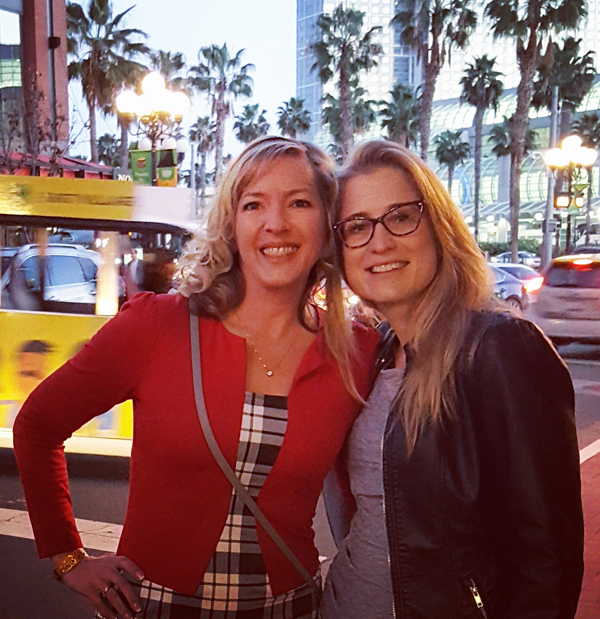 I had amazingly delicious meals while traveling last week AND tons of fun! 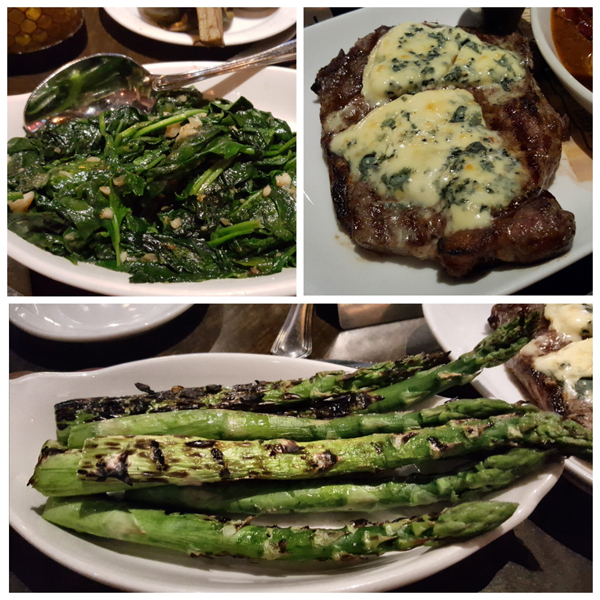 Including a HUGE ribeye steak I shared with my friend Alice in the bustling San Diego Gaslamp Quarter ~ where we also shared a grilled artichoke, sautéed spinach and grilled asparagus. My lunch the next day was a beautiful salad of butter lettuce, seared scallops & prawns. 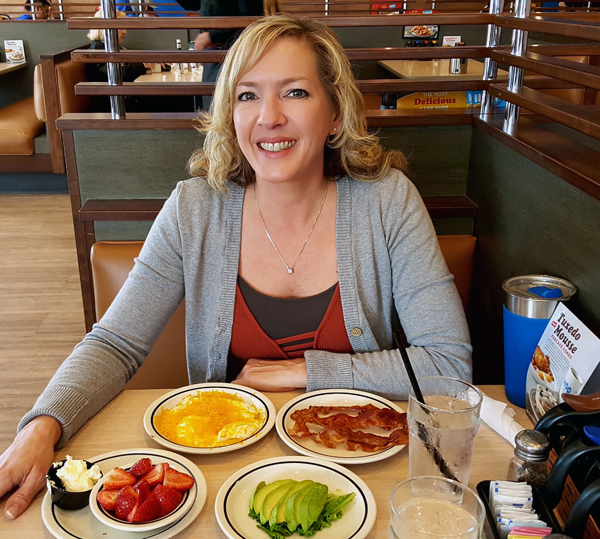 Saturday in San Diego I ate a delicious low carb meal of “real foods” at IHOP, then an easy low carb dinner in the Phoenix airport. Sunday was low carb take-out (bacon & eggs) from the Cracker Barrel by my hotel, a fabulous low carb restaurant lunch with my siblings, then low carb dinner at Ruby Tuesday in Clarksville that night with my son. Not ONCE did I feel the least bit deprived. Life is busy and full and go-go-go. There are tons of options and choices every single day. But… if you have to eat anyway, why not eat healthy? It’s as simple as choosing what you want to put in your body – and ALWAYS knowing (and honoring) your priorities. It’s not JUST good for the body, it’s good for the heart the mind and the soul, knowing you’re on your right path. You’re always happiest when your choices align with your goals & priorities – right? So keep it simple and: choose HAPPY! I want to SMILE more, second guess myself LESS, and make every day the best day it can be. I want to keep improving, keep moving, and ENJOY life, while I still have the opportunity – and have a “today” to live. Today is a good place to be. Today I can be mindful of my goals, today I can make all the best choices for myself, today is easy. Then I’ll wake up tomorrow and do “today” all over again. I like the way I look now, and I like the way I feel. Mostly I really LOVE being in total control of that. There’s a HUGE sense of accomplishment that feels amazing: I did that!! And with that came an inner strength and improved self confidence that flows through every other part of my life. While my body is not perfect, and reaching my goal weight hasn’t meant it’s the end of my journey or that I’m done improving (because I have a lot of toning to do still!) it feels GOOD to be able to say: I like the way I look. There has never, not once, been a donut that made me feel as GREAT as that cute little dress. It seems like such a simple thing that should come so easy: “I like myself.” It wasn’t easy for me to get to that point though. There’s so much more to the transformation than can be captured in a photo, or even seen by the human eye. Again: You are worth it! Never stop working toward what you want, or how you want to feel. Never give up, no matter how many times you trip up. Get serious with yourself, and get committed to discovering what it FEELS LIKE to reach your goals. This low carb journey started out as just about weight loss for me, but it has resulted in SO much more than just pounds or a number on the scale. I like the new me. My next goal: to LOVE how I look and feel. 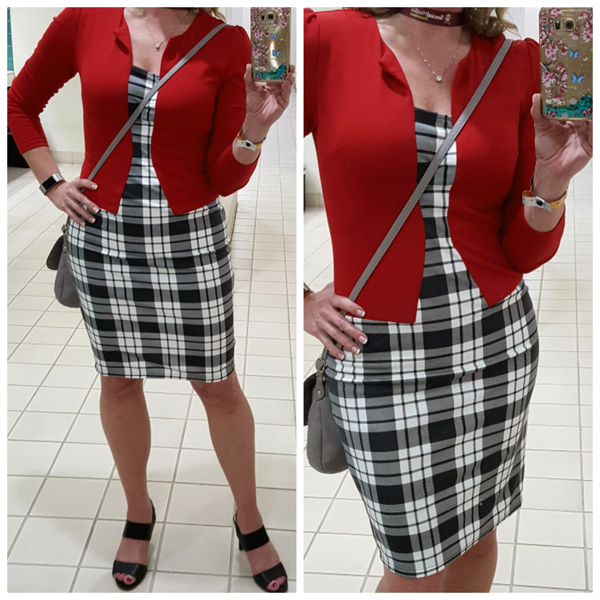 And to be able to look in the mirror and say “I like the way I look” … without Spanx on. haha! Every single choice you’ve made in your life has brought you where you are today. And every single choice you make from today forward, will take you exactly where you want to go. Earlier on in my journey, with many more pounds on and much farther away from my goal (or from even liking myself), I had plenty of days where I figured a binge here and there or “taking the day off” wasn’t going to make that big of a difference anyway. That’s exactly why it took me so long to get where I am now. It is EVERY choice, EVERY day, that matters. Every single minute one after the other stacks up to your “Today” – and why it is what it is, or is NOT. Keep that in mind as you make your way through your busy life, your social outings, the mundane work week, your usual routine, etc. Chocolate ganache is a delectable mixture of chocolate and cream that is most commonly used as an icing, filling, sauce, or glaze. It’s traditionally made by combining heated cream and chocolate and blending them together until it reaches a smooth consistency. My recipe transforms this classic chocolate delicacy into something that is 100% paleo-approved. 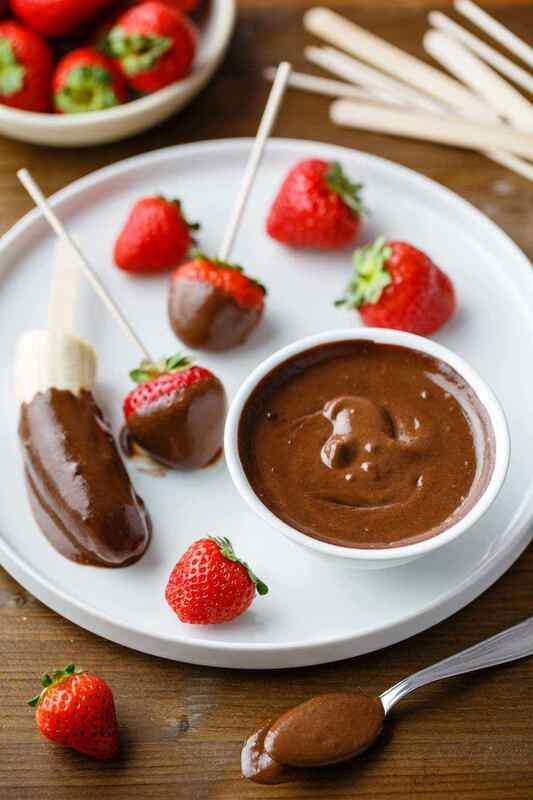 It uses cacao powder and fresh dates to make a delicious chocolate ganache fruit dip that can be prepared in only 10 minutes. The best part about this chocolate ganache is how easy it is to prepare. All you need to do is take the fresh dates and cacao powder and then combine them with almond milk, coconut oil, and vanilla extract in a blender. Once this is done, you’re all set to enjoy it with your favorite fruits. 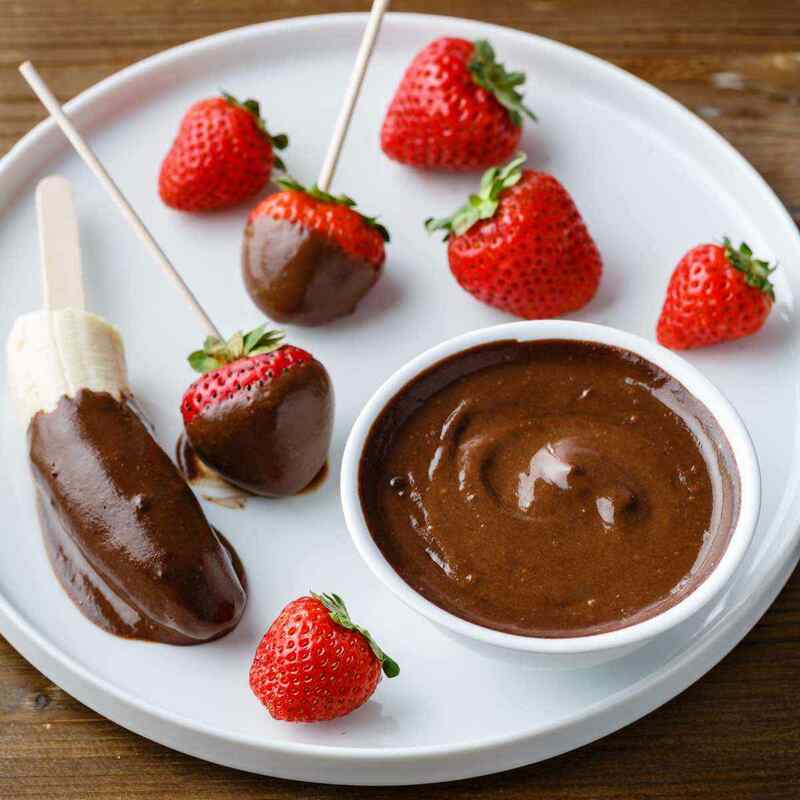 I absolutely love dipping strawberries in ganache whenever I prepare it at home. When it’s that time of the month, it’s not uncommon for women to have cravings for chocolate. If you’re one of those people, this recipe is absolutely perfect for that. They say that the chocolate cravings are signs that you need to eat more magnesium, however, there are currently no studies that support this theory. Despite this, many women swear that they feel better when having some chocolate before their menstrual cycle commences. 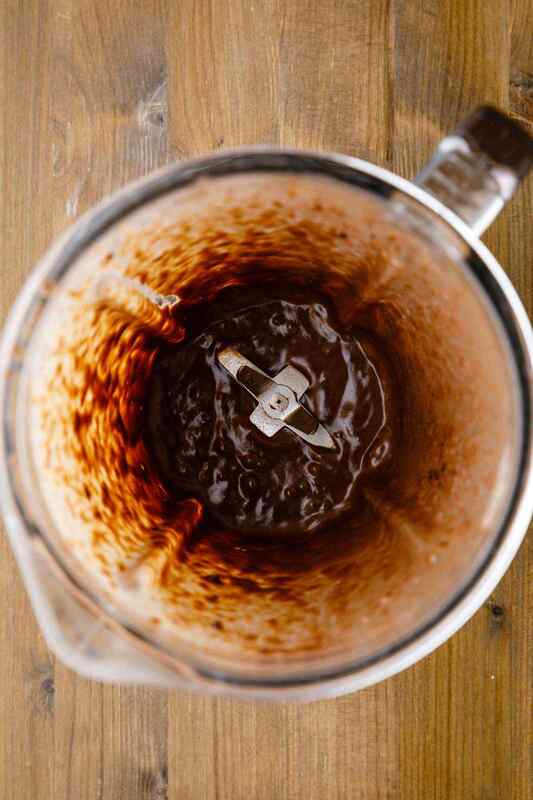 The cacao powder in this recipe is an excellent alternative to milk chocolate, not to mention it contains more nutrients than regular commercial chocolate. I love making this recipe for the simple fact that it’s so straightforward to prepare and takes next to no time at all. 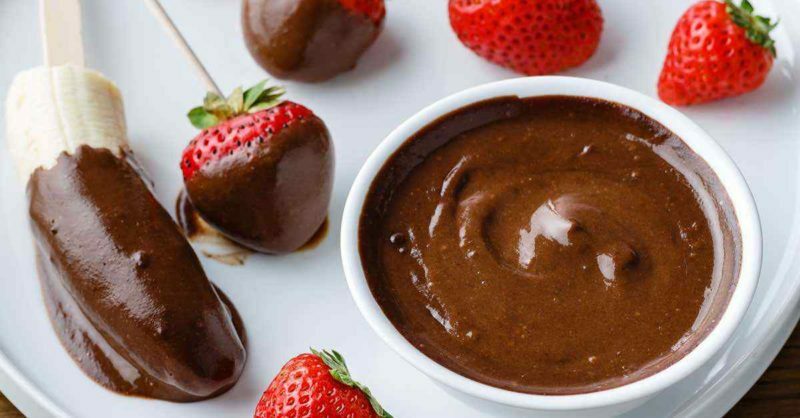 Whenever I want to add a little extra to a healthy fruit snacking session, I can make this ganache in 10 minutes and all of a sudden, my bowl of fruit has turned into a mouthwatering paleo dessert. Garlic knots are a variety of garlic bread that originated in New York City. They are made from pizza dough scraps that were repurposed to make appetizers and light snacks. Over the years, they have remained quite popular in pizzerias and restaurants that serve pasta. 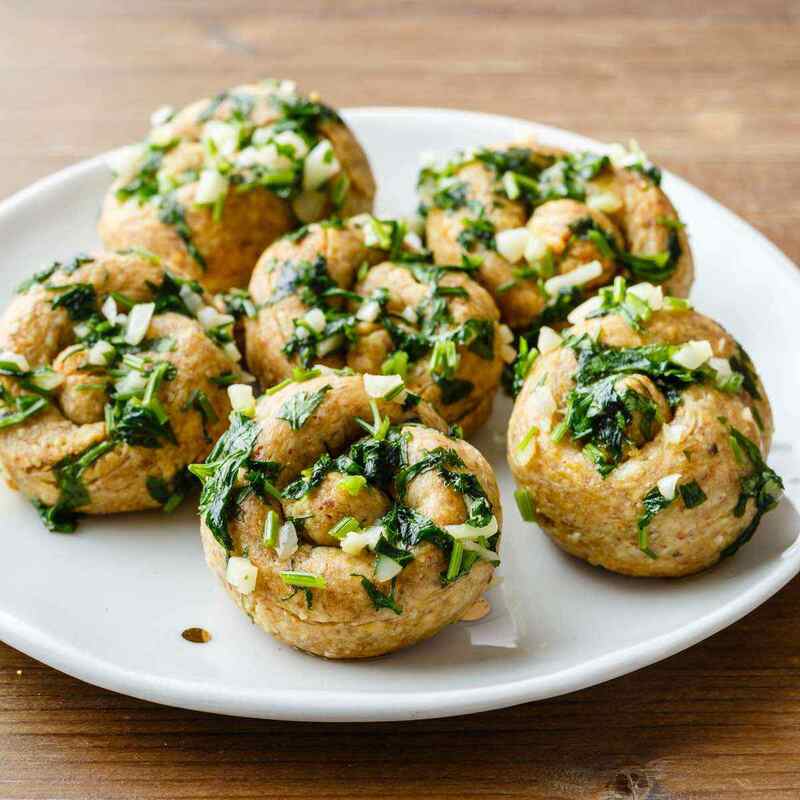 Today I wanted to share a paleo version of the famed garlic knots that mimics a pizza dough texture without the processed ingredients. The main ingredients will be almond meal and arrowroot flour, and we’ll be using garlic powder to season it with. Garlic Powder vs. Fresh Garlic – Which is Better? A good rule of thumb for garlic powder is to use 1/2 of a teaspoon in place of 1 garlic clove. Garlic powder is essentially just garlic cloves that have been dehydrated and pulverized into a powder. The taste is usually sweeter and milder than fresh garlic, which is why the garlic powder in this recipe is used only towards the end. 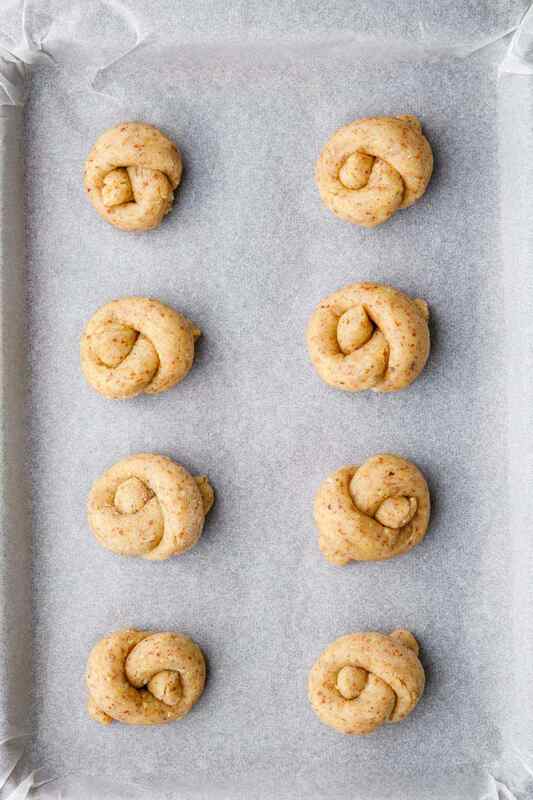 To make your garlic knots, you’re first going to need a great pale bread dough to work with. Some of you may already have your own favorite homemade paleo garlic bread that you regularly make and that’s fine; you can probably make do with that already. However, I really like this dough for making garlic knots because it gives it that crisp outside while still having that soft interior. 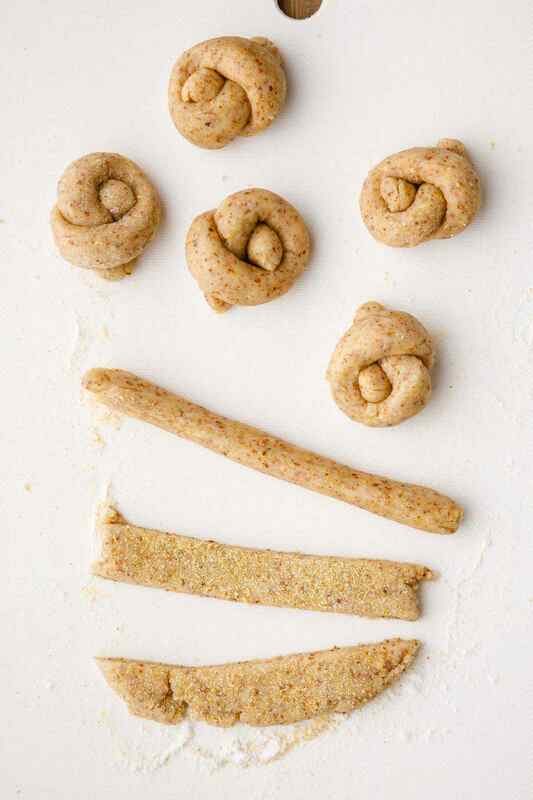 Instead of using refined wheat flour, which can trigger inflammation in many people (1), this dough is made using almond meal and arrowroot flour as a base. The almond meal is low in carbs, high in fiber, grain-free, and packed with vitamins and minerals. Meanwhile, the arrowroot flour helps to form the dough-like consistency. It also helps with providing digestive benefits along with being totally gluten-free as well. Baking soda, almond milk, and olive oil are also added to the dough mixture to tie it all together. And finally, there is, of course, a generous sprinkling of garlic powder at the end to seal the deal. You can never have enough garlic, right? If your garlic cloves aren’t flavorful enough, feel free to use garlic infused olive oil instead of just regular olive oil. This will add another subtle hint of garlic to your bread, which is great if you don’t have garlic powder on hand to finish it off. 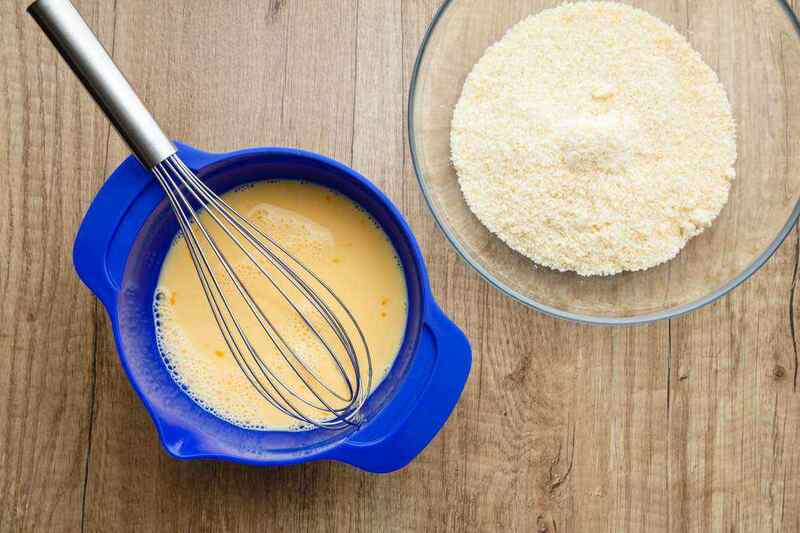 In a large bowl, mix together the almond flour, arrowroot flour, garlic powder, baking soda and salt. Add the almond milk and 1 tablespoon of olive oil and mix to make a smooth dough. Lightly dust a working board with some extra arrowroot flour. Roll out the dough into a rectangle 1/3 inch thick. Dust with extra garlic powder. Cut the dough lengthwise into 8 strips. Roll out each strip into a rope then tie it into a knot. Place them on the prepared baking sheet. Brush the knots with ½ tablespoon of olive oil. Bake for 12 – 15 minutes or until they are just starting to turn golden. Meanwhile, in a small saucepan heat 3 tablespoons of olive oil over medium heat. Add the garlic and cook, stirring, until just softened, about 2 minutes. Stir in parsley and season with salt. 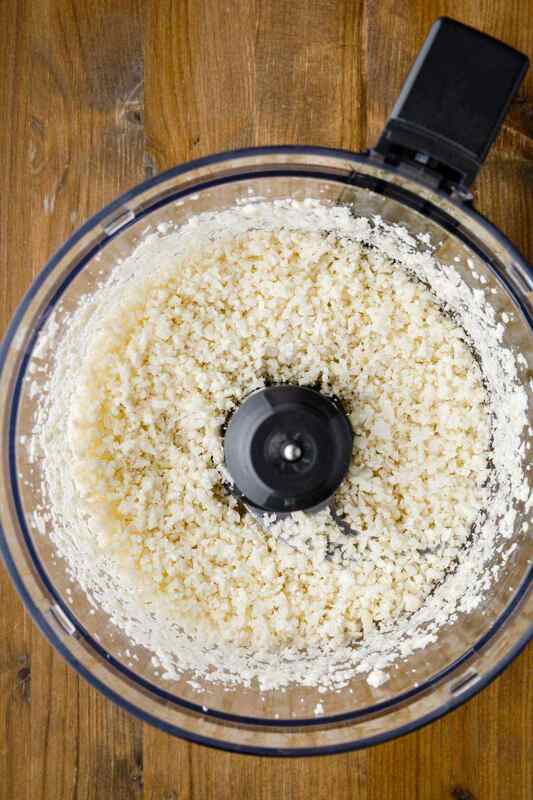 Transfer the garlic mixture to a bowl and add warm knots. Gently toss until coated and serve. 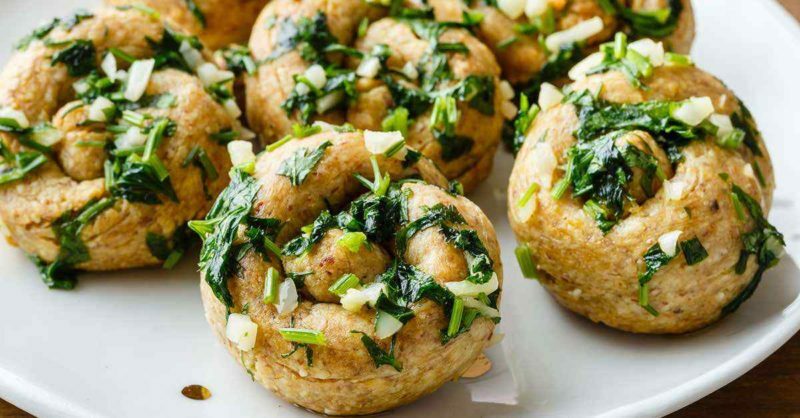 These paleo garlic knots truly do make quite an addictive snack. 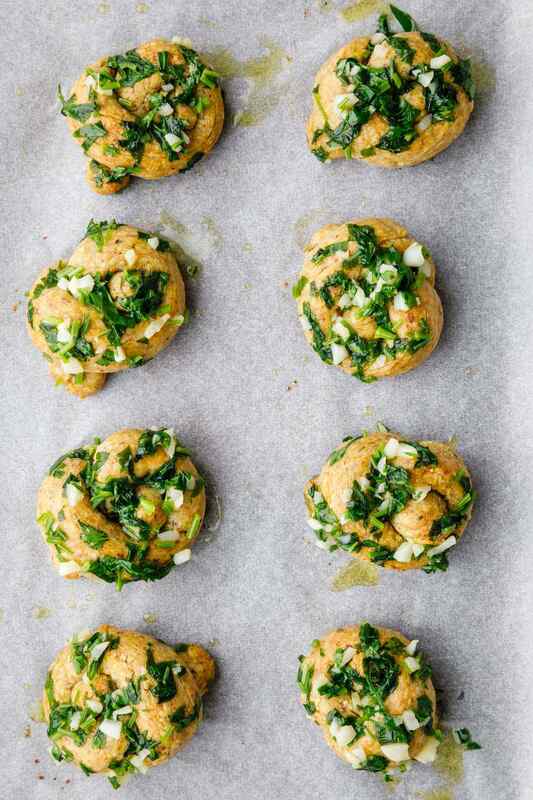 With their delicious garlic flavoring from not only the coating but also the garlic powder used in the dough, they can be enjoyed freshly made or reheated in a toaster oven. Feel free to whip up some homemade paleo tomato sauce to enjoy with them as well. P.S. – Since we’re on the topic of pizzas and homemade crust, be sure to check out this list of recipes that would work well with our garlic knots. I’m back! ? If you missed the “traveling low carb” updates & tips I shared along the way, you can find those on my Facebook Page – or on my Instagram. I had a great trip home! First I’m getting settled in & rested up – and of course waiting anxiously for all 3 keto boxes to arrive this week!! ? It’ll be fun to see what we get this month! I got home still in ketosis and weighing LESS than when I left. Yay! I tested using the new ketone strips I talked about in my last post. – I scored us a promo code for them too, and these are a better brand and a GREAT deal. Anyway, it felt GREAT to get so much exercise and to stay on track through the entire trip and come home feeling happy and lean! The photo above is me in San Diego right before boarding my first flight home. 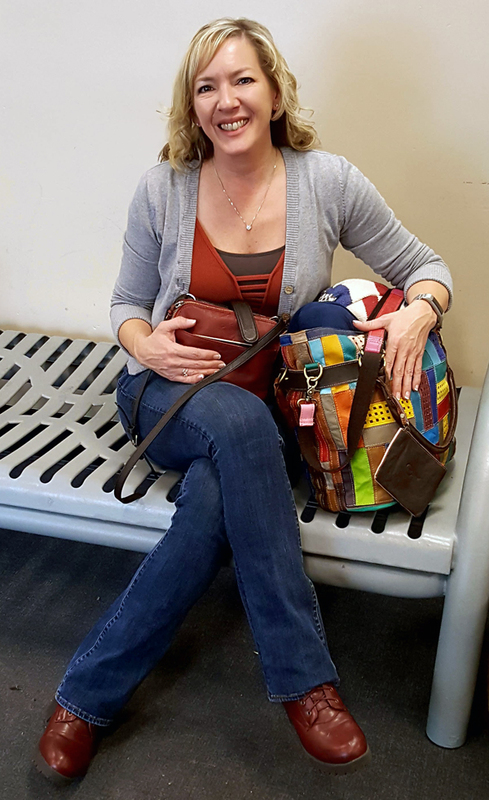 The bag is AmeriLeather (I got mine on Amazon) and it’s been a great carryon, overnight bag, and tech/laptop bag for all my gadgets when working mobile. Very multi-purpose & useful – and pretty. Stay tuned… I have more great low carb restaurant swaps & tips, ideas for low carbing on the go, and simple snack solutions. I have more fun keto-on-the-go tips & updates to come… so stay tuned! ? We’re 9 weeks into the 2018 Low Carb Challenge and it’s time for our weekly weigh-in! It’s never too late to join us by the way, so feel free to jump in now if you haven’t already. You’ll find the Week Nine Weigh In at that link in the Facebook Challenge Group, or you can comment here on this post if you’re not participating in our Facebook group. Is there anything more versatile to enjoy with your snacks than a great tasting dip? They just come in so many different varieties — cheese dips, spinach dips, hummus dips, nacho dips, and of course, plenty of spicy hot dipping sauces. The only downside is that, quite often, those dips amount to quite a significant amount of calories from mostly junk. If you’re the least bit health conscious, that’s just unacceptable, especially when there are healthy (but tasty) options around. 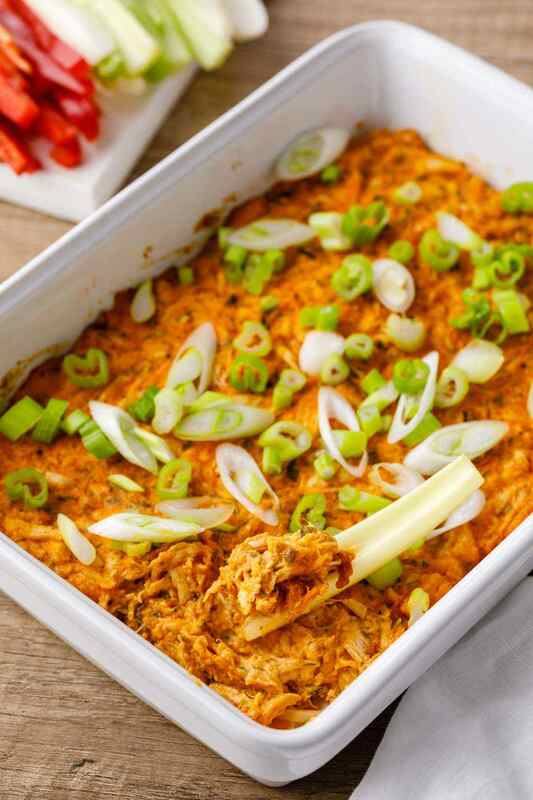 This buffalo chicken dip is one of those “I can’t believe this is healthy!” dishes that people want you to make over and over again until you get so tired of making it that you decide to pass on the recipe to someone else. This is actually my second try at a buffalo chicken recipe, and it’s even more successful than my first. If you end up not liking how this one turns out, feel free to check out the earlier version too. 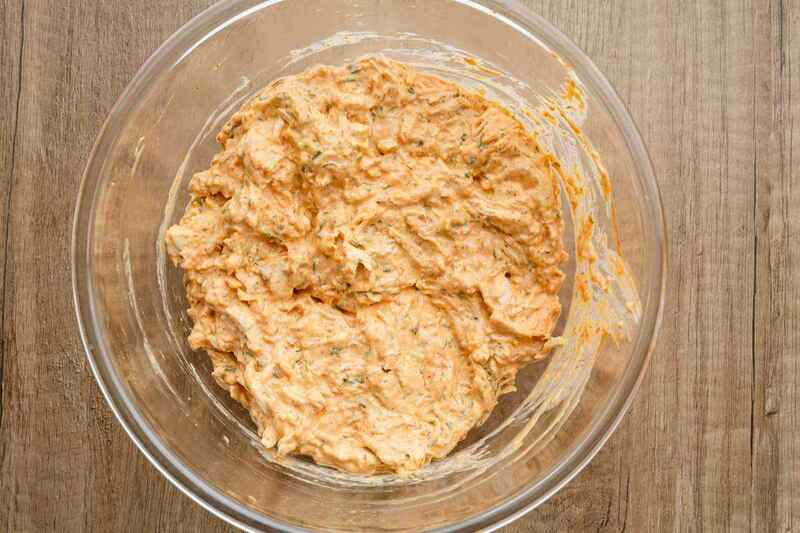 The dip itself is extremely simple to prepare and it only requires about five minutes of time. All that you have to do is place all of the ingredients together in a bowl and stir them until they’re well incorporated. 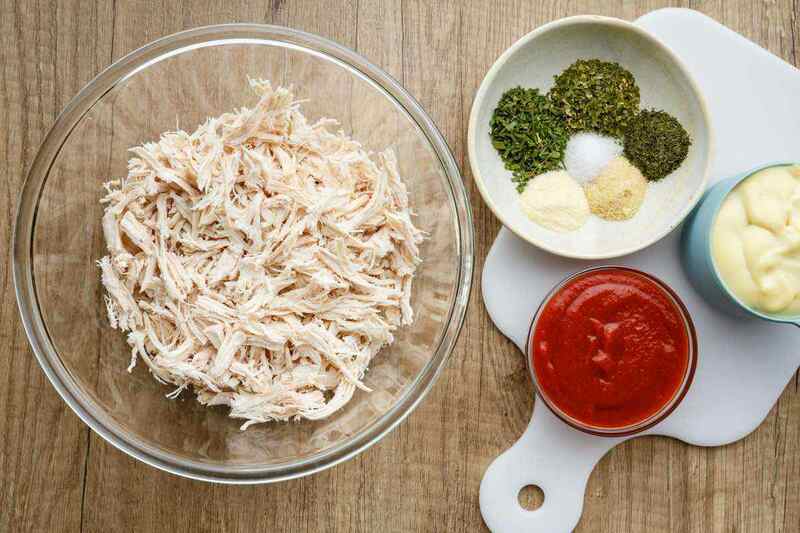 You’ll need one pound of shredded chicken breast along with some paleo-approved mayonnaise and of course, your favorite hot sauce. 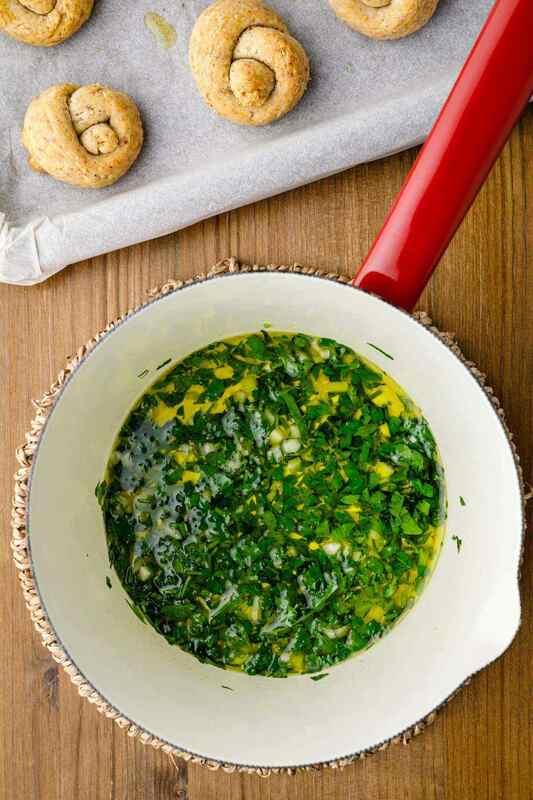 In addition to that, you’re going to add a savory mixture of herbs and spices including dried parsley, chives, dill weed, garlic powder, onion powder, salt, and black pepper. Take note that not all brands of hot sauce are considered paleo-approved. 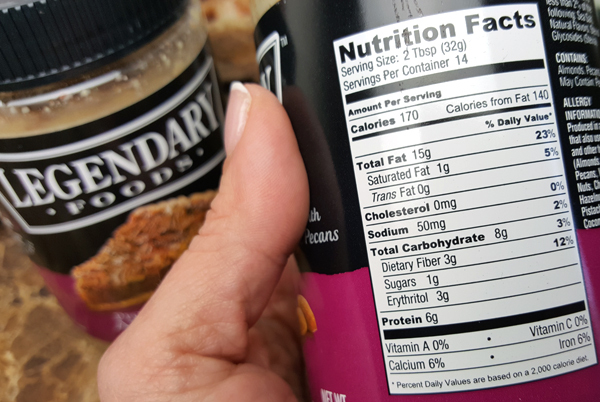 Have a look at the label for anything that’s not natural or anything that’s been overly processed. Tabasco and Frank’s RedHot are paleo favorites. 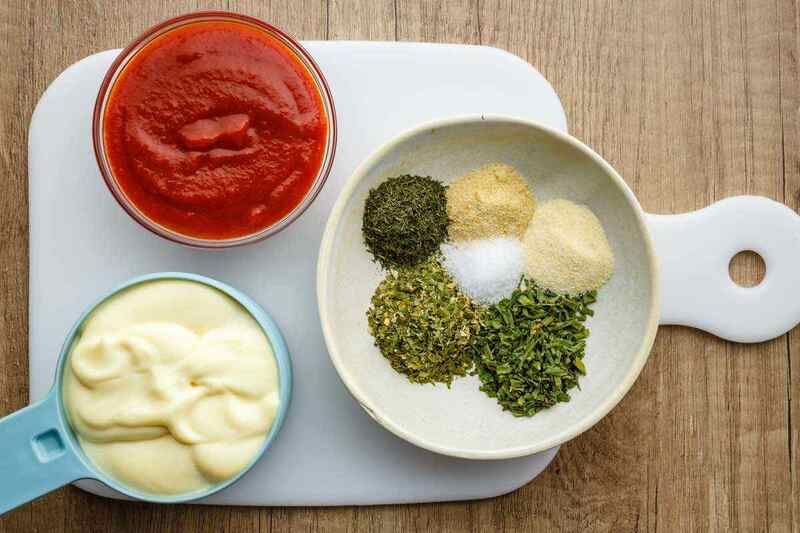 All of the above ingredients combine beautifully to make a tasty sauce for your chicken. Be sure to taste it before mixing your protein to check how spicy it is. Once everything is mixed together, it will be more difficult to adjust the flavors. Herbs and spices like those included in this recipe contain many excellent health benefits thanks to their antioxidant properties. (1)(2) They make fantastic replacements for other less healthy ingredients commonly used in many different recipes as well. There’s a reason why many different herbs and spices have been used by a variety of cultures dating back thousands of years. Frying adds unnecessary grease to your food, so for this recipe, we’re going to bake your buffalo chicken instead. Another advantage of baking is that you can get a big batch done all at once, whereas frying would require you to work in batches. Once it’s done, sprinkle some spring onion on top for a bit of crunch. 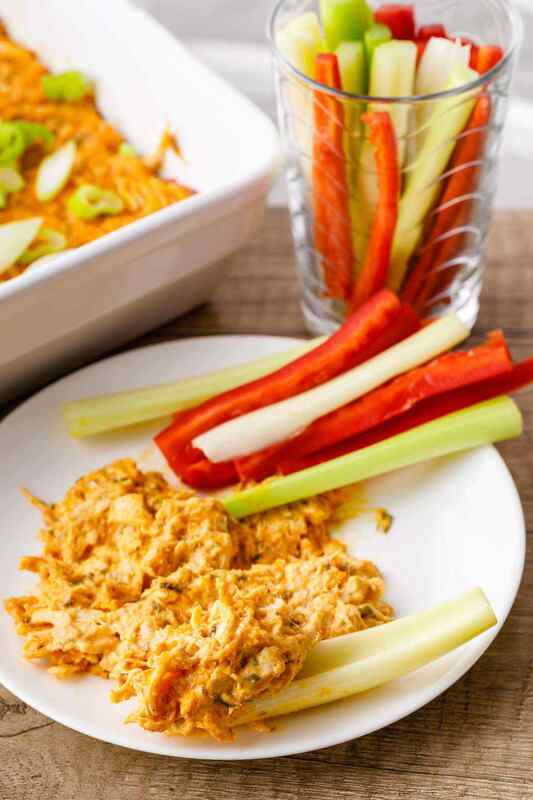 This buffalo chicken dip is absolutely incredible with our paleo ranch sauce. It’s creamy, slightly tangy, and packed with flavor which will complement this recipe perfectly. Make a huge batch because this will go quick, I guarantee it. 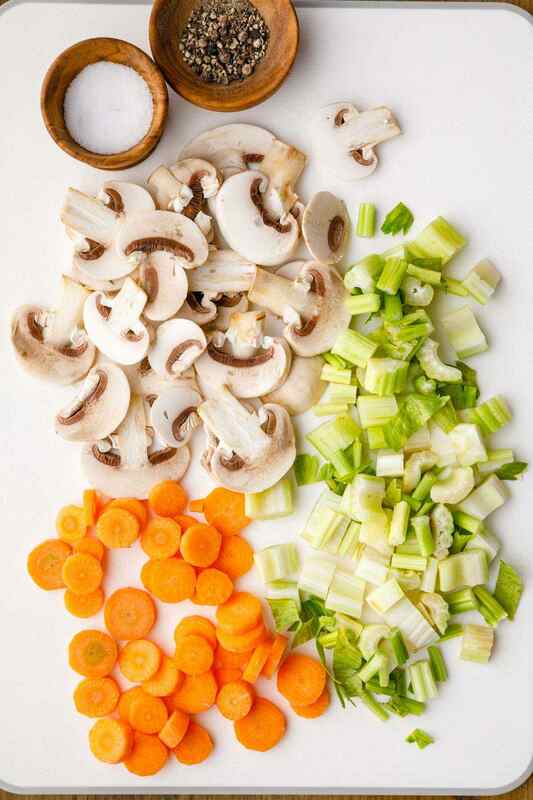 Place all the ingredients in a large bowl and stir until combine. Bake undercover for 25-30 minutes. Remove from the oven, sprinkle with spring onion and serve. Chicken wings and waffles. On paper, it might sound like a rather strange combination. In reality, though, it’s actually quite a popular breakfast meal. 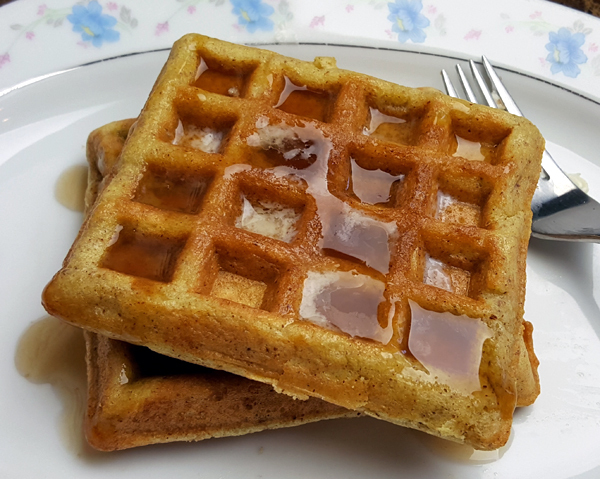 Normally this meal wouldn’t exactly be considered paleo-friendly due to how waffles are usually made, so I had to come up with my own paleo version. I’m happy to report that the combination of air-fried chicken wings with my homemade waffles is a match made in breakfast heaven. The first thing to do is prepare the chicken wings. You are going to be seasoning them in a bowl that contains salt and paleo-approved hot sauce. This will give them that classic spicy flavor similar to buffalo wings that we all know and love. It doesn’t stop there, however, as the next step is to combine almond flour, garlic powder, and salt together. You will be dredging your wings in this savory mixture before dipping them into the eggs and finally the shredded coconut. 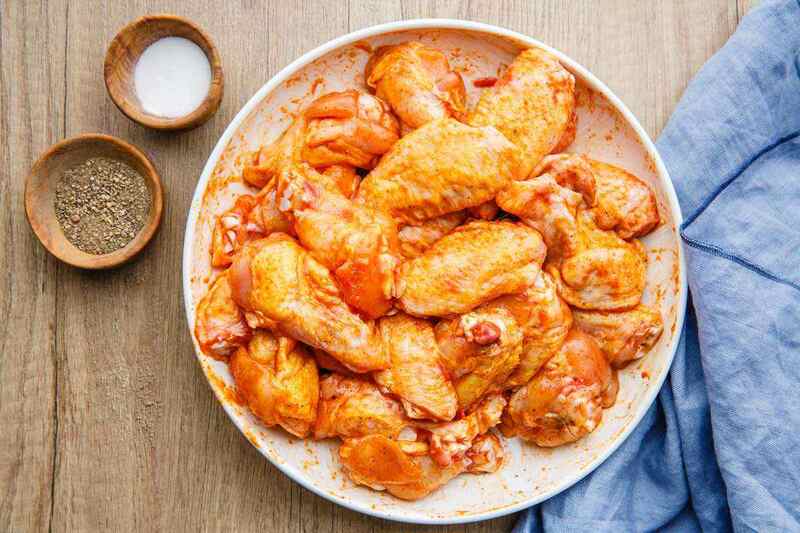 This all adds up to chicken wings that are absolutely bursting with delicious flavors — you’ll be able to pick up on the garlic, coconut, and hot sauce with every bite. 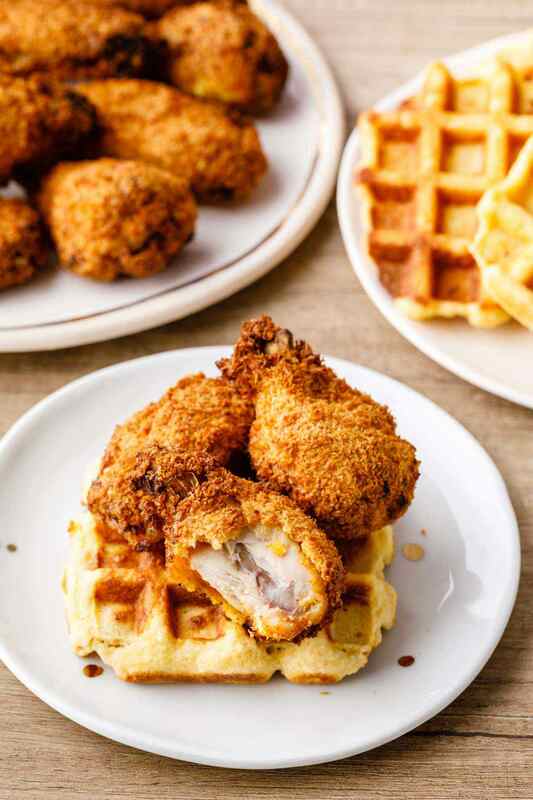 While your chicken wings are air frying, you can turn your attention to making the waffles. 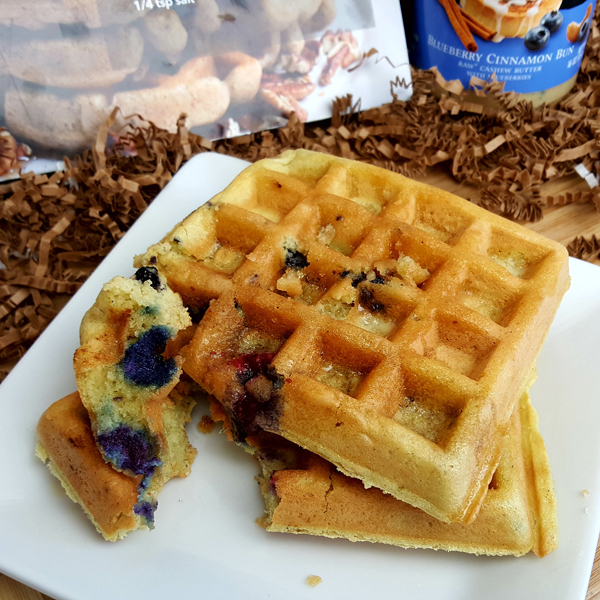 There’s nothing complicated here, just wholesome healthy ingredients that make delicious paleo waffles in no time flat. You’ll once again be using almond flour and mixing it together with baking soda. Meanwhile in a separate bowl combine two eggs, almond milk, and organic maple syrup. Contrary to what you may think, organic maple syrup can indeed be enjoyed on a paleo diet. Not only is it a natural sweetener, but it also contains plenty of vitamins, amino acids, and phenolic compounds. It’s even been demonstrated to inhibit the growth of cancer cells. (1) All that’s left to do is combine this mixture with the almond flour and baking soda and then use a waffle maker to cook them. Once your waffles are prepared, serve them warm along with the chicken wings. This is actually an incredibly balanced breakfast meal that is perfect for anyone who is on a paleo diet. 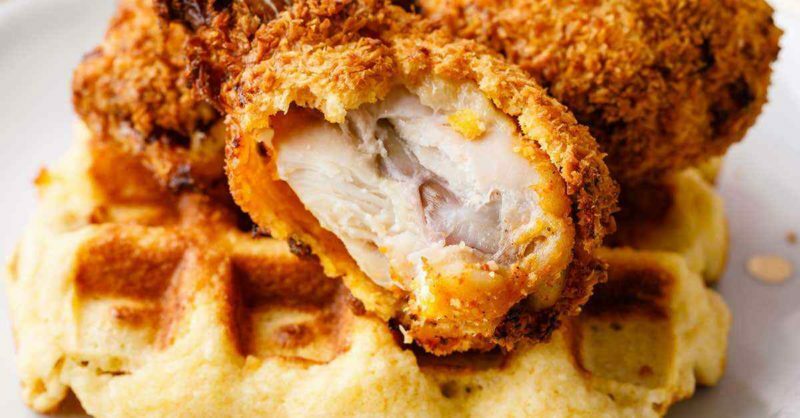 It’s high in protein thanks to the chicken wings, and the waffles are completely gluten-free thanks to the use of healthy alternatives to wheat flour. And what a combination of flavors! The chicken wings are perfectly spicy with a delicious blend of a garlic and coconut aftertaste while the waffles are oh so sweet and tasty. I’d recommend drizzling the waffles with raw honey as well to add a bit more sweetness if you’d like. Split the wings at the joint into wingettes and drumsticks, then discard the wing tips or use for stock. In a bowl place the chicken wings, hot sauce and ½ tsp salt and toss to combine. Set aside. In a shallow dish combine the almond flour, garlic powder and pinch of salt. Set aside. 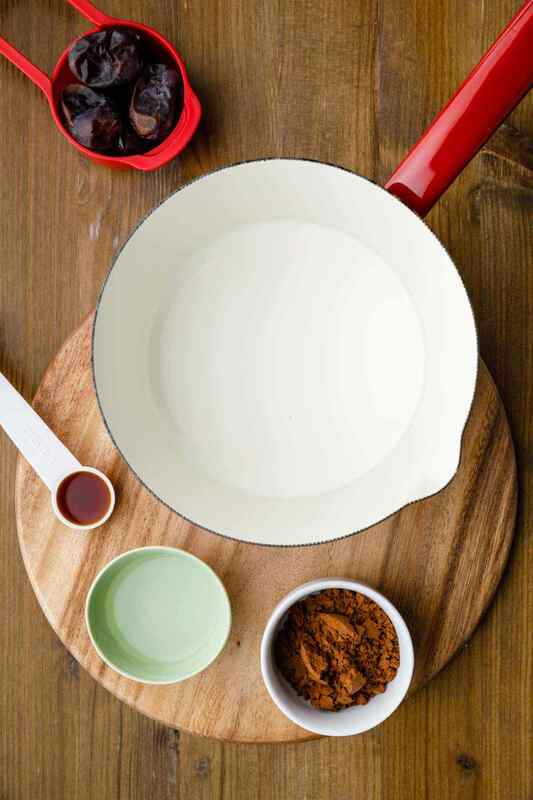 Beat the eggs in a shallow bowl and season with salt. Set aside. Place the shredded coconut in a shallow plate. 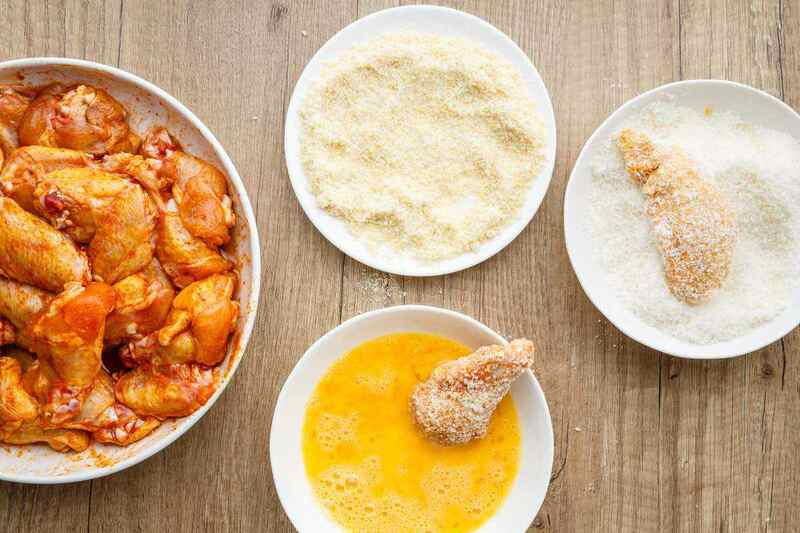 Dredge each chicken wing in the almond flour mixture then dip into the eggs, followed by the shredded coconut. Place the chicken wings on a chopping board and brush with olive oil. 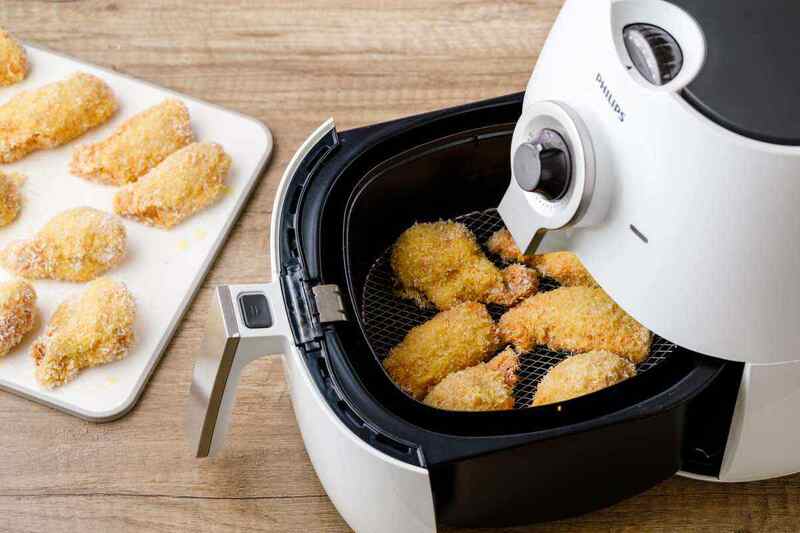 Preheat a Philips air fryer to 360°F. 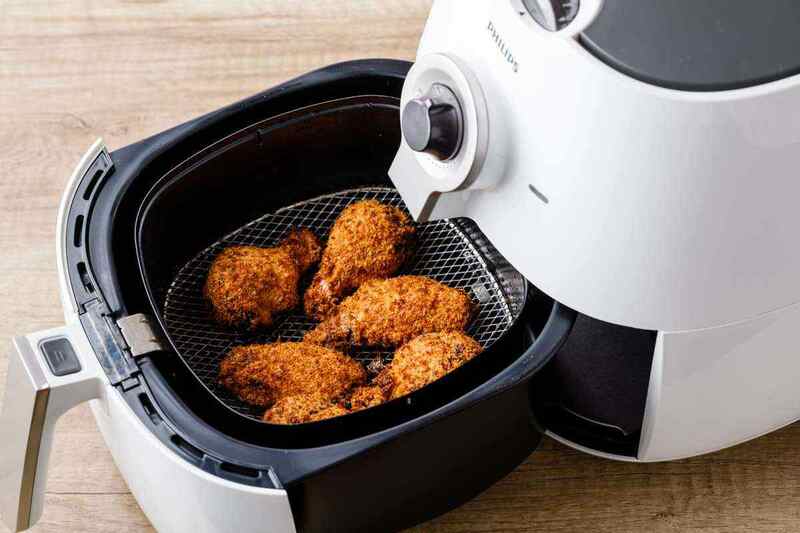 Place the wings in a single layer in the fry basket and insert into the air fryer. Cook for 15 minutes. Remove the wings from the basket. Repeat this process with the remaining wings. While you are frying, prepare the waffles. In a bowl combine almond flour and baking soda. Set aside. In another bowl add the eggs, almond milk and maple syrup. Whisk until combine. Pour the wet ingredients into the dry and mix gently with rubber spatula until well incorporated. Spread a little coconut oil on both sides of waffle maker and pour just enough batter to fill the bottom part, do not overfill. Cook for 4-6 minute or until golden brown and easy to separate from the waffle iron. (cooking time depends on the heat of your waffle maker). 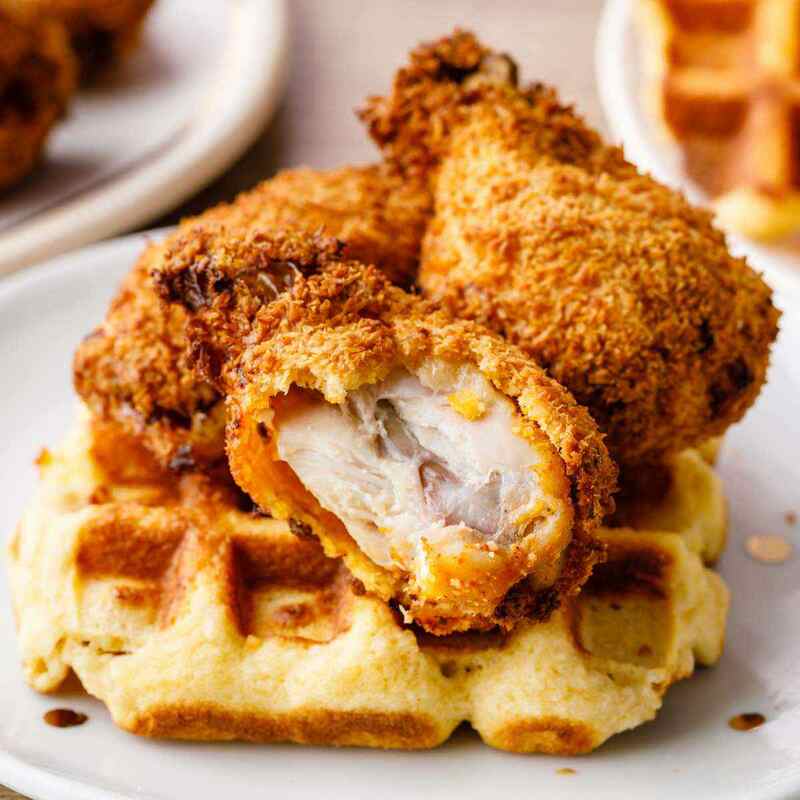 Serve warm chicken wings with waffles.